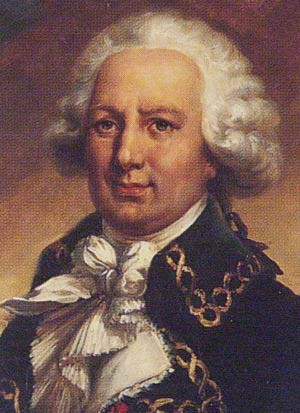 This French military commander and navigator was above all an inquisitive explorer of new areas in the world. On one of his travels he reached from the East the Australian coast and sailed northwards to the Solomon Islands, the Bismarck Archipelago and sailed further to the West along the northern coastline of New Guinea. Bougainville Island (in the North of the Solomon Islands), Bougainville Bay and Mount Bougainville (both in Papua New Guinea just at the Indonesian border) are named after him. 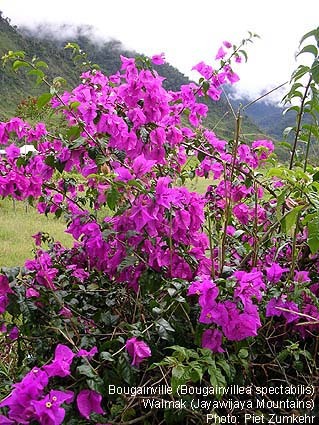 But most famous is his name in the common and beautiful flowering plant as pictured here. We selected a relevant part of his comprehensive biography which describes his travels along the coast of New Guinea. On 8 August a small island appeared ahead. The Boudeuse and the Etoile passed to the south of the island but close enough to observe the presence of many coconut palms and houses. Numbers of canoes were out fishing but the occupants ignored the passing French completely. Bougainville named the island Ile de Anchorites (Hermits) on account of their seeming isolation and self-contentment. The island and some adjacent smaller ones are still called the Anchorites or the Kaniet Islands. One of the other islands was seen further west and Commerson called it Sae. (Strangely the name Hermit Islands is now applied to Maron and Luf Islands, further south and not seen by Bougainville). The ships were sailing just south of west when on 9 August two small islands appeared. They were followed by a cluster of many others. Bougainville called the group L'Echiquier (Chessboard) but the islands are now known as the Ninigo Group. Again, Bougainville was wary of grounding and did not attempt to land. Keeping the islands to his north, he passed between them and another isolated island, Liot, off to the south. Bougainville called Liot La Boudeuse after his own ship. The French headed southwest away from the islands. By 11 August the ships could see the mainland of New Guinea. Between Vanimo in Papua New Guinea and the Irian Jaya border are situated Bougainville Bay and Mount Bougainville. On the 13th two mountains were especially clear, which Bougainville called the Two Cyclops. A coastal range of mountains running west from Jayapura on Humboldt Bay is still called the Cyclops mountains. A series of small islands lie off the north coast of New Guinea and over the next few days Bougainville sighted them but did not attempt to land. Progress was slow on account of the state of the Etoile. A group of islands, Pulau Podena, in Teluk Walckenaer was called Iles des Falaises while Oger, the pilot of the Boudeuse, had his name bestowed on the next island they passed, though it has reverted to being called Pulau Jamna. On 15 August Bougainville could see a particularly high mountain, which he called Moulineau (it was probably a mountain of 2193 metres in the Foja Range). Another island, L'Isle d'Alie, one of the Pulau Koumamba islands, followed. The currents were against them and then the surface of the sea started to be covered with material such as tree trunks, leaves and fruit, denoting the outflow of a large river. Indeed, the River Mamberamo enters the sea close by Tandjung D'Urville. On the 18th the much larger offshore island of Biak came into view. Morale was low and food continued to be in extremely short supply causing them to kill and eat their last dog. They were now close to the Equator and the ships crossed the line several times. By the 21st, Bougainville had regained the coast of New Guinea in the form of the Doberai (Birdshead) Peninsula but the next day the coast began trending to the south. He was aware that he was nearing the western end of New Guinea, off which there were many small islands and routes through them were hard to locate. While waiting once more for the Etoile to catch up Bougainville sent Suzannet to investigate two small islands, Pulau Su but no houses and people were seen or food obtained. Bougainville could now see a wide passage (Dampier Strait) between New Guinea and an island, Waigeo, off to the west. He realised he had the choice of attempting to make the passage or go round to the north of Waigeo. A tentative effort was made at negotiating the strait but currents and winds forced the ships back and they steered for the north of Waigeo. Even then they were in danger as they were driven close to rocks and over reefs. On 24 August, sailing west, they saw canoes along the coast and could see the atolls of Pulau Ayu to the north. Their troubles were far from over as, the next day, approaching the western end of Waigeo, Bougainville was faced with three passages to choose from to get him through to the open seas to the southwest. He chose the southern passage between the islands of Waigeo and Kawe, off to its north. The French sailed through safely and called their route French Passage. It was later called Selat Bougainville (Bougainville Strait).